Search engine optimization (SEO) is the process of making your website easier to find via Internet search engines, such as Google or Bing. While there are many factors that affect where your website ranks in search engine results, there are a few things you can do to ensure that it is "search engine friendly." For example, titles and system names are very important as a search engine may categorize a page partly based on the keywords used in its naming. In addition, using relevant keywords and structuring your content properly will be highly beneficial when a search engine takes inventory of the content of your pages. Below are some guidelines to follow when building your website. According to the World Wide Web Consortium (W3C.org), the title you give a page is "the most important element of a quality Web page" and is designed to provide a short piece of text that should represent the document in browser window title bars, bookmarks and search engine result listings. In the CMS, when you give a page a title (not to be confused with headings as addressed below) you will see it reflected in three areas: the side navigation, the breadcrumb links and in the title bar at the top of the browser window or tab (by default, your site name and Carnegie Mellon University are added after the page title in the browser's title bar). Because the title of a page is considered to be the single most important identifier of what the page is about, great care should be taken to ensure the title contains the top keywords associated with the page. Meta descriptions are the small snippets of content users see on the search engine results page (SERP) below the title of your page. They should accurately summarize the content of your page and entice would-be visitors to click on the link to your page. The more people who click on your link from the SERP, the higher your potential for better rankings. Meta descriptions should incorporate relevant keywords where applicable, and they should be filled out completely for each page on your website. In the CMS, the meta description is the Description field located just below the Title field. Every item (e.g., page, folder and file) in the CMS has a system name. System names appear in the folder structure on the left. In addition, a system name of an item gets displayed in the live URL for that item. The CMS will automatically generate a system name when a new page or folder is created. However, it is highly advisable that you manually assign a relevant system name based on the content of the page or folder. Learn more about system names including recommended guidelines and good and bad examples. A very important factor to making your website search engine friendly is to populate your content with keywords that are highly relevant. Sift through your content and take note of important words and phrases that you feel are most relevant to the topic being discussed. Once identified, you can then further enhance your content by focusing on these words and phrases and using them in your content often (referred to as "keyword density"). Overall, a website that has been optimized to use relevant keywords will have a greater chance at appearing in search results when those keywords are searched for. Keep in mind, your goal is not to just draw traffic to your website, but to draw targeted traffic (i.e., traffic that is specifically looking for the information you have to offer). 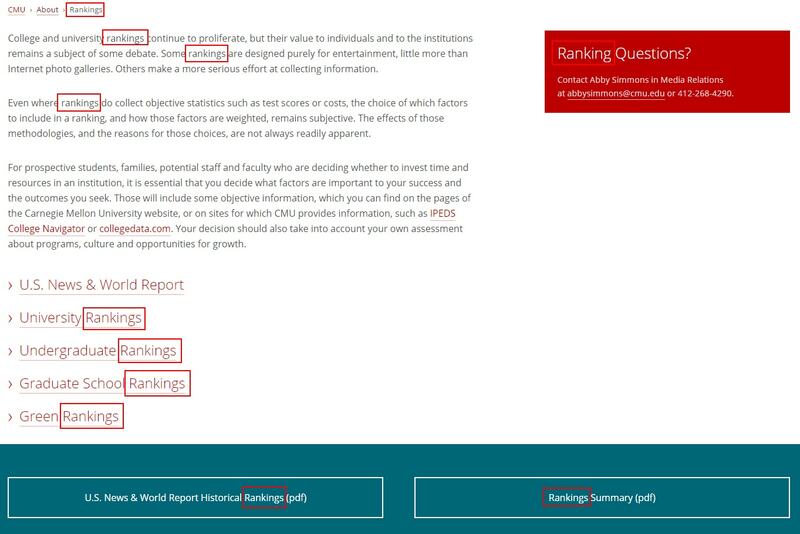 For example, notice that on the Carnegie Mellon "Rankings" page, the keyword "rankings" is used more than ten times. In the example, the keyword "rankings" isn't forced in the content; it occurs naturally. You don't want to overuse keywords as too much keyword density can be seen as spam by search engines. Tip: When possible and when it makes sense, place keywords higher on the page and as the first few words within your header titles. Search engine crawlers tend to look in these areas first. 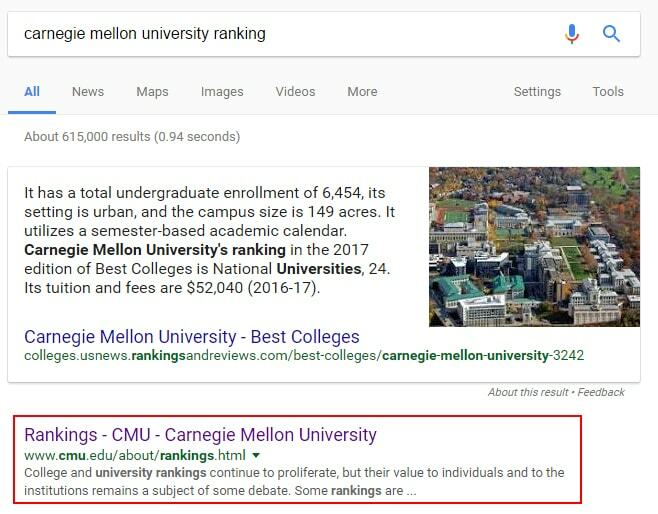 It's no surprise then that searching "carnegie mellon university ranking" in Google yields the CMU webpage on "rankings" in the top results. The official CMU "Rankings" page appears in the number two spot just below a featured snippet. Note: The algorithms search engines use to determine results are constantly changing. A page that is in the number two spot could drop to the number five spot on the same day. Having the right keywords on your pages will help improve their rankings. Search engines will crawl through your website and categorize it based on its content. Written content that has been structured using heading and paragraph tags is much more conducive to being search engine friendly, and proper steps should be taken to format content for this reason. Heading tags should be used for every heading throughout your website, and the bulk of your written content should be formatted using paragraph tags. The CMS offers several different levels of styled heading tags that can be used to designate the headings of a page. Heading 1 carries the most importance and is styled to be the most prominent heading on a page, therefore it is usually intended for the first and topmost heading. Headings 2, 3 and 4 are used for subheadings and are styled to portray their level of importance respectively. You may use a heading tag more than once on a page, and you do not need to use all of the heading tags. The bulk of your written content should be properly formatted into paragraphs using paragraph tags. A paragraph tag is automatically generated whenever you hit "Enter" or "Return" on your keyboard while writing text in the CMS. However, you can also highlight a chunk of text and format it into a paragraph by using the pull-down menu. Change between tags using the "Format" button ( ) in the WYSIWYG toolbar. Because CMU is a major research institution and considered by search engines to be an authority in many fields, search engines regularly crawl (ie. scan) CMU websites for up-to-date, relevant content. However, how frequently search engines crawl is unknown. So it's a good idea to let search engines know when you've made a major change to your website or created a new one, as it gives them a digital nudge to crawl your site. There's no guarantee they will, but it can't hurt. And it could expedite your site appearing in search results. Google Search Console - Track your site's search performance with Google Search Console. Get the data, tools, and diagnostics needed to create and maintain Google-friendly websites. Bing Webmaster - Bing Webmaster provides easy-to-use public tools to help you do more with your site. Improve your site’s performance in search, get access to free reports, tools and resources. It can take some time for your site to appear in search engine results. What's more, if you've updated your content or navigation, your search results may appear different than before. Search results can also be different based on geo-location (where the search came from geographically), device (desktop versus mobile), how often your site is crawled (ie. scanned) by search engines and a whole slew of other reasons. Results can even change minute-by-minute. This is because search engines are continuously updating their search algorithms and optimizing results for users. But fear not. Focus on applying the best practices listed above, using keywords and creating compelling content to attract users to your site. The search engines will handle the rest. Learn more about SEO by watching our recommended Lynda videos.